Another advantage of commercial products is technical excellence. Just as credit unions exist to satisfy the financial needs of members, data and analytics companies are highly experienced in their distinctive competencies. Not only is a product purchased but the buyer also benefits from the accumulated technical acumen of the vendor, something the credit union would be unlikely to possess in-house. Maintenance and enhancements are also easier with a commercial product. Vendors must stay up to date to be competitive and a tested product is less likely to have maintenance problems. The experience of the vendor also benefits the credit union in the form of Design Depth. There is an old medical adage that the best outcomes are experienced by surgeons who perform the most surgeries. The same can be said of companies specializing in data and analytics for credit unions. With deep experience across many implementations, these companies have “seen it all” and bring that expertise in the form of design that is deep and complete. Simply stated, this means the credit union is purchasing product benefits that reflect best practices from across the industry. Another benefit is that commercial data and analytics products are “generic”. This seemingly negative attribute has become a powerful advantage in the collaboration-oriented credit union industry. The standardization of data provides huge opportunities for securely aggregating data and sharing it among credit unions. Such regulatory mandates like CECL and technological innovations like predictive analytics depend on large pools of data that the average credit union is incapable of accumulating on its own. The secure aggregation of standardized data is a game changer not only for the individual credit union but for the industry as a whole as it battles banks and fintechs for its share of the retail financial service market. Graham speaks from experience. One example of this is BankBI’s work with Ideal Credit Union (Saint Paul, MN) to deliver the BankBI Financial Performance SaaS application. As a first step, BankBI worked with Ideal Credit Union EVP/CFO, Dennis Bauer, and his team at Ideal CU to understand their financial reporting priorities with the aim of delivering a successful outcome. As stated by Dennis, “During this process BankBI worked to map and mimic our chart of accounts exactly as we would produce in-house and then present it back in dashboards and reports that were easy to consume in terms of both its appearance and content. The fact that BankBI was able to replicate what we needed rather than having to change everything was a major plus." What was striking about initial setup was that we found it so easy to organize it on either a top level, trend-based appearance or in a more granular way where we could dig down and see loan portfolios and subsets of those portfolios. We also really liked both the professional way it looked and felt. BankBI had mapped and recorded our data and come back with something that looked and felt much better format-wise but that we could still consume and understand. The Decision: What is Right for Your Credit Union? 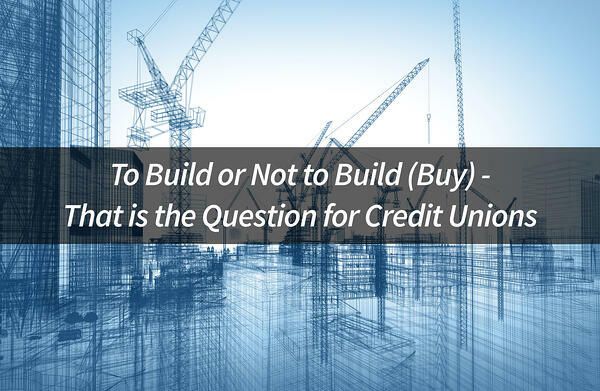 In the end, the Build or Buy decision is dependent on your credit union’s unique situation. If your organization has substantial financial, technological, and skill resources, then the Build option may seem to make more sense. However, the vast majority of credit unions do not enjoy this high resource level and even with such resources the advantages of buying commercial products far outweigh any advantages of a do-it-yourself project. As a result, the Buy option with a strong consideration of the SaaS model is an effective and efficient way for your organization to begin the essential data and analytics journey.